of ministries in a power-sharing government, the opposition said. be formed by the end of the week. spirit of a power-sharing agreement," said Mr Chamisa. affairs, state security and finance ministries. The situation in the country was dire, he said. his return from the UN General Assembly meeting in New York. "We never said there was a deadlock." agreed on September 15 to a landmark power-sharing agreement. resolve Zimbabwe's political deadlock and economic melt-down. leaving 80 per cent of the population living in desperate poverty. ministers, rendering the opposition toothless at the helm of the country. justice and even women and youth." majority and Tsvangirai forced Mugabe to a presidential run-off poll. Mbeki and signed on September 15, the government was to have 31 ministries. faction of the MDC, led by Arthur Mutambara. affairs, finance, local government and foreign affairs. National Union - Patriotic Front (Zanu-PF). affairs - and thus control of the police - to the opposition. thinking when they signed it. The agreement left Mugabe with all the powers. It was defective because it never allocated the levers of power. glove to bring back foreign direct investment. seen as lacking clout now that he is no longer president. 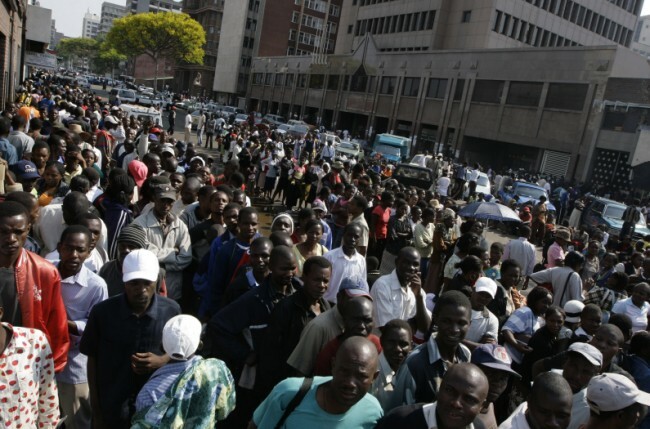 Tens of thousands of people are queuing at Zimbabwean banks in a desperate bid to withdraw cash before its value evaporates. 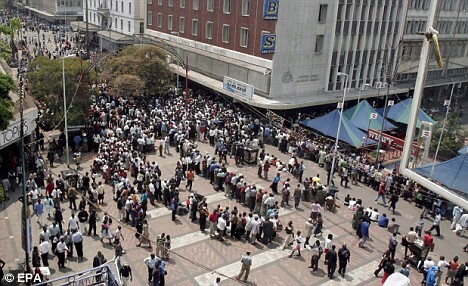 Crowds of savers lined up to remove their money after the daily bank withdrawal limit was raised to 20,000 Zimbabwean dollars - about £17. The previous $1,000 limit was barely enough to buy a newspaper. Official inflation has hit 11 million per cent and the central bank issued higher denomination banknotes to tackle the cash shortage. Mothers with babies strapped to their backs arrived at dawn to get at their savings while campaigners called for the withdrawal cap to be scrapped. Lovemore Matombo, head of the Zimbabwe Congress of Trade Unions, said if politicians did not take action soon to ease the suffering of workers 'we will go onto the streets'. He called for the limit on withdrawals to be removed altogether, but central bank officials say that could spark a run on banks that would worsen the cash shortages. On Saturday, central bank governor Gideon Gono vowed to keep printing money despite warnings that the practice is fuelling inflation. As the queues disrupted traffic in the capital Harare yesterday, President Robert Mugabe returned from a 10-day trip to the UN promising a new coalition government will be named soon. Getting the long-promised government up and running is seen as a first step to addressing the southern African nation's growing economic and humanitarian crisis. But with his absence, a power-sharing deal he signed with his rivals in the Movement for Democratic Change has stalled. The two sides have been unable to agree which party would control key Cabinet posts, among them the Finance Ministry. He also warned US ambassador James McGee, an outspoken critic, to stop 'interfering' in domestic matters. Mugabe's rival, Morgan Tsvangirai, who is to be prime minister in the unity government, has said a new government must be formed within days to avert a humanitarian crisis. This is true inflation, when the governments thinks it can get out of trouble by printing more and more money. What we have is not strictly speaking inflation. we have price increases. If wages start to increase to match then that becomes inflation! Heavens knows what 11,000,00% means. the country should have collapsed ages ago - can someone explain this? And yet there are still people in Zimbabwe who support Mugabe. Makes me think that not everyone is suffering, or else they are very, very foolish indeed. Tsvchangeri was a damn fool to sign up with Mugabe as he will become embroiled in the financial meltdown and Mugabe will see to that he will carry the can. governor, Gideon Gono, unveiled new currency. and his major rival Morgan Tsvangirai leader of the Movement for Democracy. leader of a small breakaway faction of the MDC was also a signatory. tenure of office as governor of the central bank. 000 and $20 000 notes which went into circulation on Monday, September 29.
organisations can now withdraw $20 000.
holders can now withdraw any amount from their accounts without limitation. the appearance of the new notes. production so that goods do not cost a lot of money." enshrined in the Constitution and international conventions. Minister of Finance or any other Cabinet minister. central bank from imposing withdrawal limits. withdrawal limits become inadequate," read the application. Harare-The new 20-thousand-dollar note unveiled by Zimbabwe’s central bank in a bid to ease widespread cash shortages is printed on ordinary paper and lacks any such security features as a watermark or security thread. 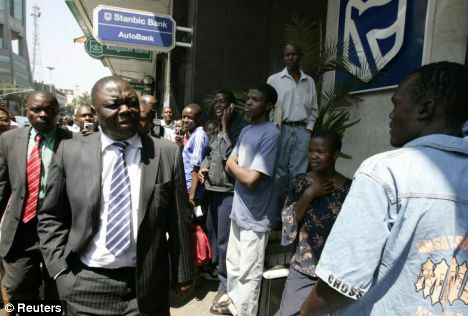 The Reserve Bank raised the daily withdrawal limit in Zimbabwe, prompting tens of thousands to line up in desperate hopes of getting enough cash for groceries before spiraling inflation eats away more of the currency’s value. New rules went into effect the day President Robert Mugabe returned from the UN allowing withdrawals of up to ZIM$20 000 ($35). 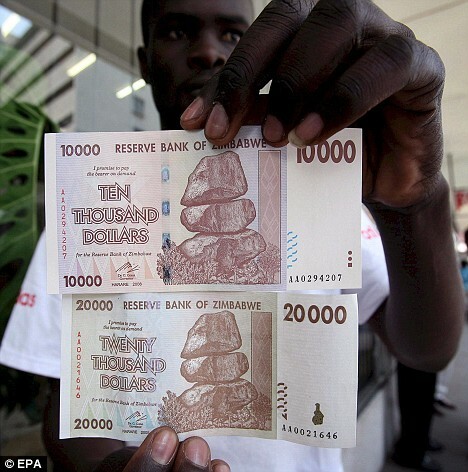 The old ZIM$1 000 limit was barely enough to buy a newspaper. 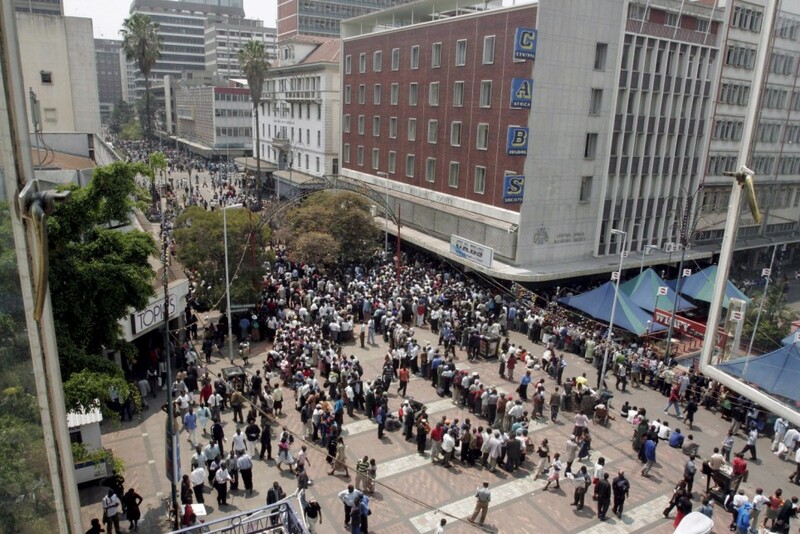 The limit and the fact that Zimbabwe has the world’s highest inflation rate, officially 11-million percent, unofficially much higher, has meant long lines at banks most days. But Monday was extraordinary. Mothers with babies strapped to their backs arrived at bank doors at dawn. Police vainly tried to stop the crowds from blocking traffic, but there appeared to be more police and uniformed soldiers in line to get cash than on duty. On Saturday, central bank governor Gideon Gono vowed to keep printing money, a practice critics say has fueled inflation. rivals has done nothing to change the situation on the ground. Chiefs, who have allegedly not benefited from the land reform programme. veterans and high ranking ZANU PF members," for land and moveable assets. societies closed around 3pm while the commercial banks closed around 5pm. triggering an increase in the price of imported items. to meet their daily requirements. rights lawyer Alec Muchadehama, is representing the petitioners. LUPANE, 30 September 2008 (IRIN) - In Dongamuzi village, in the Lupane district of Zimbabwe's Matabeleland North Province, Jestina Moyo, 56, is making a deal she knows is unfair, but she also knows she has little choice but to barter one of her few remaining cows for six buckets of maize to feed her family. As in many other villages, people like Moyo have steadily seen their livestock depleted this year as animals are exchanged for grain in a bid to survive the country's acute food shortages. There is an air of despair in rural areas. This year's elections brought widespread political violence on top of worsening food shortages, which the UN estimates will see more than 5 million people of the country's 12 million population requiring food assistance in the first quarter of 2009. In the bitter election contest earlier in 2008, President Robert Mugabe's ruling ZANU-PF party banned non-governmental organisations (NGOs), including those distributing food, from operating for nearly three months on allegations of political interference. Although the restrictions have been lifted, hunger still stalks the country. Moyo exchanged her cow to feed her eight orphaned grandchildren and a sick relative in her care. "After pounding the maize, the mealie-meal [maize-meal] I will get will only last a month, as I have to make porridge for the children before they go to school and I have to cook lunch and dinner. The amount is too little, as I am taking care of a sick nephew who has to eat frequently throughout the day," Moyo told IRIN. "These people are taking advantage of the food shortages to rip us off. The exchange is not fair but I have no choice, as there is no grain throughout the whole district; but this is a rip-off," Moyo said, watching the cow being loaded onto the truck that will take it, along with many others, about 200km southeast to Bulawayo, Zimbabwe's second city. So far this year she has bartered six cows for either food or money to pay her grandchildren's school fees. "At the beginning the year things were better because villagers were selling the cows for cash, and this allowed us to buy more grain amongst ourselves, but the whole village has nothing now and we have to get the grain from outsiders, who only want to exchange the maize for livestock," Moyo said. She said one bucket of maize was now equal to four live chickens or a goat, while five buckets of maize were where negotiations started for a cow. Livestock was also being exchanged for soap, cooking oil, flour, sugar and salt, which are not available from shops. Zimbabwe's annual inflation rate of more than 11 million percent has made the local currency all but worthless, and although many city residents have resorted to using foreign currency, in the poor rural areas the only items of value people possess are their animals. "Villagers are losing a lot of their livestock to these people from urban areas who are ripping us off, and as long as the hunger issue is not resolved we will continue losing our livestock," Moyo said. "President Mugabe and [Morgan] Tsvangirai [leader of the opposition Movement for Democratic Change (MDC)] should come up with their unity government, so that we will have food on the table. You should tell them we are starving, and if nothing is done we will all die," Moyo told IRIN. Zimbabwe's political leaders agreed to a power-sharing deal on 15 September, but the formation of a unity government is being stalled by bickering over ministerial posts. Thomas Ncube, 58, who also lives in Dongamuzi, told IRIN he had exchanged all his goats and had nothing left to barter with. "The people who are selling maize are refusing cash, saying the Zimbabwean dollar loses value fast and they only exchange the grain with livestock, and most villagers have become poor from exchanging their livestock for grain." The misfortune of the villagers is providing George Ncube, who has a lucrative business touring the countryside bartering farm animals for maize, and then sells the livestock to city abattoirs and butcheries. "We [dealers] are providing a service because the people will die of hunger. We are exchanging items; there is no robbery, as the exchange is done on a willing-buyer, willing-seller basis, and if one is not happy then they do not become part of the deal," said Ncube. The MDC parliamentarian for Lupane North, Njabuliso Mguni, told IRIN the food shortages in his constituency were reaching critical levels. "The food aid agencies are returning, but not all villagers qualify for food aid, and that leaves quite a large number on the verge of starvation, and they are now resorting to selling off and exchanging their livestock for survival," Mguni said. Zimbabwe's main harvest will only be gathered in March 2009, so the prospect of the food security situation improving anytime soon is remote. Making matters worse is that small-scale farmers have no access to vital agricultural inputs, such as fertiliser and seed. "We are less than a month into the farming season and already there is no fertiliser or maize seed being made available to villagers," Mguni said. "And I foresee all this repeating itself in future." Nations summit to avert a military coup, according to media reports. outstanding issues pertaining to the inclusive government. the outstanding differences," said MDC spokesman Nelson Chamisa. fled to "Australia and South Africa". finalisation of the inclusive government. positions are tangential," said MDC secretary- general Tendai Biti. He added: "As far as we know, there was no agreement on anything." give legal effect to the power-sharing deal. of at least 400 which overpowered security guards. Police dispersed the crowd by firing rubber bullets. Some had bleeding legs where rubber bullets had hit. a teething problem" and the same would not happen on Tuesday. officers were stationed at the entrance. back, officers fired rubber bullets. to pile up in the middle of the street. with toddlers tied to their backs fell as they tried to get away. going on," Carlos Mambosasa of Zimbabwe said. so scared my baby would be hurt," Shamso Duali of Somalia said. problem with queues because the street's very narrow. from some in the international community. Theron, vice president of Zimbabwe's Commercial Farmers Union. been lost, deepening the suffering of the country's people. will be expected to unite to resurrect Zimbabwean agriculture. in the cities," says Hill. cities, far away from farmlands. crops, and crops into food. the past decade or so." rebuilt from the ground up, and that's going to take time and money." most serious cereal shortages since 2000.
the things that Zimbabwe simply cannot manufacture locally." But Geoff Hill counsels against a "mass allocation" of land to Zimbabweans. better work, not parcels of land." move away from the rural areas and into urban areas. challenge is to feed them once they're in town." landowners who won't be productive. land ownership and agriculture in Africa. actually asked that question when I address people inside Africa." it's just not going to happen." was given to the whites - should compensate them for their loss. drop of a hat," Hill explains. their homeland before deciding whether or not to return. to work the land productively. government must have the right to throw people off (the land)." manner, and better economic policies. white farmers. But he says the policy should be "one person, one farm." exchange to get Zimbabwe moving forward again." Mugabe's ZANU-PF government significant political and economic support. Humanitarian groups say this has exacerbated Zimbabweans' suffering. affairs of a sovereign country. international cost, a measure of accountability, for the (Mugabe) regime,"
says Colin Thomas-Jensen, the Enough Project's Africa Advocacy Manager. to see that level of international pressure." and human rights concerns should be solved by Zimbabweans themselves. Thomas-Jensen says Beijing's stance "doesn't hold any water." Mugabe and ZANU-PF to go." these enterprises complicit in the human rights abuses of the regime. Thomas-Jensen says China's actions regarding Zimbabwe are "undoubtedly"
really that that's been driving the Chinese interest in Zimbabwe," he says. turn also have close ties to Chinese state-owned enterprises. it wasn't in the best interests of all our people." supply in Zimbabwe and the country's own currency is almost worthless. from white farmers to "Chinese interests on a contract farming basis." 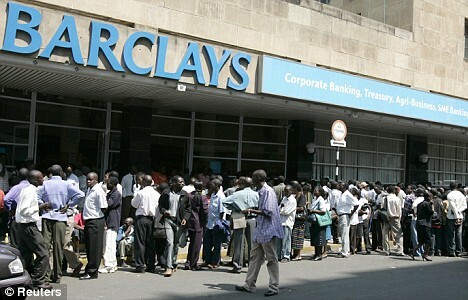 Zimbabwe so far, as it's business plan for the country is long-term. Beijing, whose aid comes with no strings attached. him are indeed eventually given real powers to shape government policy. it's for the mutual benefit of both China's and Zimbabwe's people. Thomas-Jensen says he doubts Tsvangirai will simply "let bygones be bygones"
with regard to China's recent role in his homeland. Industry and Marketing Board said. ``There is still a lot of tobacco on the farms,'' Matibiri said. Zimbabwe produces mainly high-grade flue-cured tobacco that rivals the U.S.
for quality, and flavors cigarettes such as Marlboro and Benson and Hedges. exchange isn't realistic,'' Ferreira said. buy their foreign exchange, it is worth 1 million Zimbabwe dollars. $181 million a year earlier. situation is set to get worse. rations, for the next nine months. 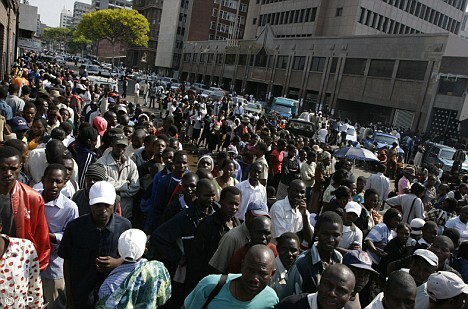 assistance for the dire food crisis in Zimbabwe. multi-solution response to the world-wide food crisis. up government this week, towards the end of the week." transitional authority as the panacea to the current electoral dispute. are likely produce another poor harvest. The confusion over Cabinet appointments has not helped the situation. homes dry and forced residents to rely on unsafe sources of water. drain and the shortage of drugs. thus exposing consumers to health complications other than cholera. to the public," said the association. the middle of the dry season is particularly disturbing. a picture for your update/interest). of protection as they have had a long on-going saga with war vets etc. window - and on the way a young male lion then attacked her. and now her continued treatment which will include further surgeries. Margy sparrowsmith@yoafrica.com or simplywild@zol.co.zw . trauma and desperation that they have been through).